Spacious, modern 2 BR condominium on the spectacular white sandy beaches of Cancun. Our complex 'CONDOMINIOS BRISAS' is located on Cancun's most pristine strip of white sandy beach on the crystal clear turquoise blue waters of the Caribbean Sea. The location places guests 5 min. to the Iberostar Golf Club, 10 min. to Kulkulcan Plaza -one of the finest shopping malls in Cancun. It hosts fine shops & fine restaurants such as Ruth's Chris Steak House. We are only minutes away from 'Venturapark' a huge water park where you can swim with the dolphins. Our largest mall 'La Isla' only 11 min away- home to a giant underworld aquarium (worth checking out)! Our condo is clean, spacious, and nicely furnished, with comfortable bedding and wonderful views. Our complex has 24 hr security, an adult pool and children's pool , tennis court, minimart, and ample parking and of course, our beach. There is a Bus Stop in front of the complex. No need to rent a car, the buses come every few minutes and are inexpensive and quite efficient. You can book various activities such as horseback riding, fishing, scuba diving, snorkeling, parasailing, windsurfing, skiing, boating, jungle tours, Mayan ruins, and visiting a bird/wildlife sanctuary. The Master BR has a king size bed, and two balconies from which you view both ocean and lagoon. The 2nd BR has 2 twin beds and has 14 feet of glass overlooking the lagoon. The living room has a wrap-around balcony that overlooks both the lagoon for colorful sunsets, and the Caribbean for sparkling sunrises. Activities: Scuba, snorkeling, parasailing, boating, deep sea fishing, Mayan ruins tours, shopping, island hopping, dancing, fine dining, flea markets, swimming with dolphins, bowling, small car racing, horseback riding (on the beach if you wish), wildlife explorations. Area: The island of Cancun is shaped as the # 7, with mainland at either end. The short leg is on the gulf side with calm, shallow waters. The long leg is the Caribbean side with clean, clear, glittering water having small to larger waves. This is our location. We're a quiet residential complex, far enough away for peace and quiet, yet close enough to all activities. We're 15 min from the airport. No need to rent a car. I have been enjoying Cancun for over 30 years. The weather is always great and there is no limit on things you can do. We stay here all winter and most times are reluctant to return home. This is truly a nature lover's paradise. There is something here for everyone. The locals are friendly, speak english, and are eager to help. The quality of the food is exceptional. There are restaurants here to satisfy your choice of cuisines. The weather is always great!!! The air is clean and there are almost no mosquitos oceanside. We bought here because of consistant great weather, and fabulous views. Fabulous views east of sunrises, and west views of sunsets. Granite countertops, in unit washer/dryer, stainless appliances, bbq grill. Spacious master bedroom. Each bedroom enjoys private bath. Breakfast nook with fabulous views of both Lagoon and Ocean. We have updated two of our three bathrooms with modern fixtures, ceramic floors and walls. Renter's can now enjoy the amenity of having an in unit washer-dryer. Enjoy both ocean sunrise and lagoon sunsets. Both views are spectacular. Complex is directly on the beach. Pool is only minutes away from your front door, ocean is below the pool. Individual wall mounted(mini-Split)Air Conditioning in each room operated by remote control. All bedding and blankets are included. Stackable laundry in unit and in complex should you not wish to do it yourself. Towels are included for your stay. Bath, hand, face and beach. Kitchen towels and oven mitts also included. Included 40 inch flat screen TV and DVD player. Enjoy sunsets on our wrap around balcony with views of the ocean, lagoon and city of Cancun. Gas stove with 6 burners of various flame outputs. Include griddle top and auto-ignite system. Large oven for all your baking needs. Oven ignitor for instant ignition. New microwave with large capacity. We feature a toaster oven for reheating, baking and toasting. Dinnerware and Silverware for 8. Demitasse cups for Expesso, Water goblets and Wine Glasses. We have a small library in the unit and small library in reception area of complex. Boogie boards, sand toys and umbrella. 2 Master Bedroom Balconies, one is private overlooking ocean and the other is overlooking both the lagoon and the ocean. 1 Large Living Room wrap around w/both views of water and city of Cancun. Aquaworld can help you with all your water sport needs. It is located 10 minutes from the complex. There are no bedrooms or showers on the first level. Cleaning included 1/wk. Extra cleaning available for $35 USD/day. Loved staying here with our family of 5. Kids ages 10,12,14. The condo has amazing 4th story views and the pool and beach were incredible. Loved that it was out of the way of the big hotels. One of the best beaches and sand on the strip. Mary was very hospitable and welcoming. Will definitely be back. Our family of 5 was very comfortable at this condo for 5 days. We arrived late on a Thursday and there was fresh fruit, peanut butter, jelly, bread and coffee waiting for us. The food was much appreciated after traveling since we weren't familiar with the area yet. The beds were very comfortable and had quality sheets and pillows. Nice towels for the bathrooms and beach towels to use at the pool. The condo was very clean. All of the rooms were very spacious and the size of the condo allowed us to spread out and not be cramped like staying at a resort or hotel. The kitchen was fully stocked and had very nice appliances. They even supplied bottled water, which was very much appreciated since water is expensive in Cancun. It is obvious the owners take pride in their property and want their guests to be comfortable. We stayed Thursday to Monday in early March and the pool and beach area was not very busy, which was nice. We never felt crowded and sometimes were the only ones in the pool. 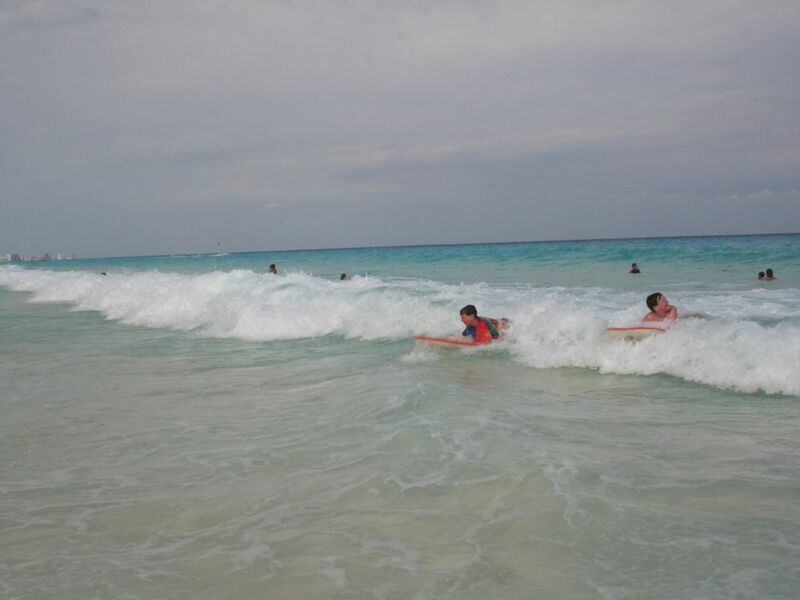 The ocean was very wavy at this time, but that's what our kids wanted. The condo has lots of water toys to use at the pool and beach, which is great when traveling with kids. The condo and property is very well maintained and has security at the gate. There is a small convenience store (soda, chips, muffins, ice cream, eggs, etc.) and a coffee shop/deli on the property. Not a large selection, but you can get a few essentials. For seafood restaurants nearby, the owner suggested Navios and Captain's Cove and they were both excellent. A bus comes by every few minutes so you never have to wait long for transportation. If you are looking for a nice place to stay away from the busiest part of the Hotel Zone, then this is a great option! Really sweet family vacation, comfortable condo. Very good experience with the condo, friendly security, no problem getting in or set up. Great location on the beach and clean generously sized pool. The condo buildings are a little worn on the outside and some furnishings show the wear of being near the sea. The kids room may benefit from adding a dresser. Maria and Gerry were excellent and responsible to emails. We prefer to find less touristy activities and enjoyed adventures into the town of Cancun to dine and grocery shop. We liked taking a taxi to Puerto Morales a few days to find calmer surf due to windy seas this season. We had a great ecotour experience to Tulum ruins and cave cenote exploration. We relaxed by the pool and played in the waves and so appreciated the condo experience over an all inclusive. We don't need fancy and fuss and so for us this condo was a good fit amidst a very tourist hotel area. I learned that the whole area of beach is really one private giant hotel after another so there's not much within walking distance to do- you can't pop into beach cafes or walk to markets on the hotel zone strip, buses and taxis are easy though. We appreciated that we had a good kitchen with water and fruits waiting for us, a very clean space and comfortable air conditioning if we wanted it at night. The breeze was great and we were muy tranquilo. Gracias Gerry and Maria! Thanks so much for choosing us for your Cancun vacation...We appreciate your feedback and will strive to make our condo more comfortable with your suggestions. We had a lovely time in this condo! It worked perfectly for our family! It had everything we needed plus more! They left us kitchen supplies and fruit and bread and peanut butter and jelly and beach supplies! It was truly wonderful! We can’t wait to go back! The property has an ocean view as advertised and is a great family value. I found the security team very helpful. They are great at making sure condo guests are only at the property to keep you safe. I left my I phone in a taxi and they called to help retrieve it. the condo has nice appliances for cooking meals. The beach is open to the Caribbean so waves and winds can be high. But that’s the coast and they have a life guard on duty. The home is well kept and they have TV and WiFi. It’s a two story and the bedrooms are upstairs. The bathrooms were well maintained. You have balcony on the ocean and lagoon so you can shift sides with the wind and the sun. It’s the little things that really count and that show the owners do care. We arrived mid day and were looked after by the security detail immediately in a very efficient and friendly manner. Thanks guys even though there was a slight language barrier. The condo is excellent, clean, very well appointed, lots of room and privacy for the bedrooms. Great balconies with wonderful views over the lagoon and sea. Very nice pool and snack bar. Beach is fantastic, lots of area to walk, my favorite thing. This is a very nice accommodation and the price was very right. Will definitely return and highly recommend. The owners are very responsive and attentive to any discrepancies even if they notice them. Thanks for the opportunity to use your great condo. Security deposit of $200.00 USD is taken when initial payment is charged. There is bedding for 4 persons. We can sleep additional persons with an inflatable mattress that is a double. We will be happy to provide extra linens for their stay also.